The City of Chicago is receiving bids for rehabilitation of its Lake Street Bascule Bridge. The double-deck bascule-style bridge was constructed in 1916 for $600,000 at the time. Bids are due May 7. The cost is estimated between $3-6 million. 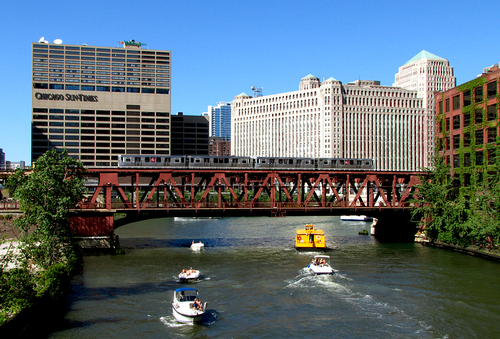 The project will involve rehabilitation of the Lake Street Bridge, which spans the South Branch of the Chicago River and will include cleaning and painting the West and East leaves. The City of Chicago is receiving bids for rehabilitation of its Lake Street Bascule Bridge. Primary connections will require surface preparation to Commercial Grade Power Tool Cleaning (SSPC-SP 15). At the contractor's option, Commercial Blast Cleaning (SSPC-SP 6) may be substituted for Commercial Grade Power Tool Cleaning at no additional cost to the department. Primary connections will then be coated with an organic zinc-rich primer. Secondary connections will require Power Tool Cleaning (SSPC-SP 3) using vacuum-shrouded power tools equipped with HEPA filtration. At the contractor's option, Commercial Blast Cleaning (SSPC-SP 6) or Commercial Grade Power Tool Cleaning (SSPC-SP 15) may be substituted at no additional cost to the department. Secondary connections will be painted with a one coat epoxy mastic system. Negative pressure containment and disposal of lead paint cleaning residue is required. Existing coatings are assumed to contain lead and could also contain additional toxic metals. Certification to SSPC-QP 1 and QP 2 is required.